We created the Sagely SuperHero Spotlight to promote those who contribute positively to our elders. Volunteers, executive directors, caregivers,….all these wonderful humans are true superheroes to our elders. 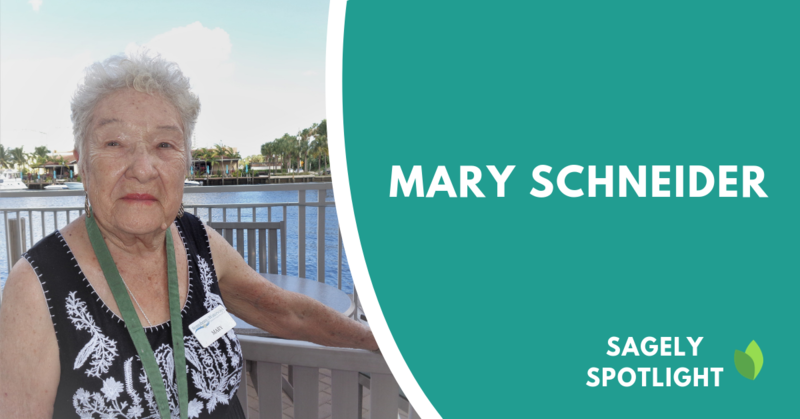 Beatriz Alcantara – Lifestyle and Leisure Director at Symphony at the Waterways is appreciative of a very special person; Mary Schneider. Because of Mary’s joyful spirit, she is an inspiration to everyone in the community. Mary Schneider, who will turn 92 in December. She is a volunteer here at Symphony since we opened in December 2016. Her son-in-law moved into our Memory Care Unit. Mary is here six days a week for at last five hours a day, sometimes often longer. Above all, she cleans and bakes for the residents’ enjoyment. One of her facorite item to bake are dog biscuits for a project in which residents go to the Abandoned Pet Rescue Center of Fort Lauderdale. They enjoy visting the animals and giving them the home-baked biscuits. The residents involved really enjoy this and look forward to it every month. Mary is very bright, caring, devoted, has a great sense of humor, and energy that does not quit! She is an inspiration for all of us. For all these reasons. we are so fortunate to have Mary with us! Let me tell you that working daily with her is one of the biggest blessings in my life! We love receiving these nominations and putting forward such inspiring people. Newer Post Veteran’s Day	Older Post Will you be at LeadingAge 2018?